I am about to start the Re-Live of the match and already know the mighty 1. FC Köln win 2:0. I don’t know how it gets there, but I know how it ends. 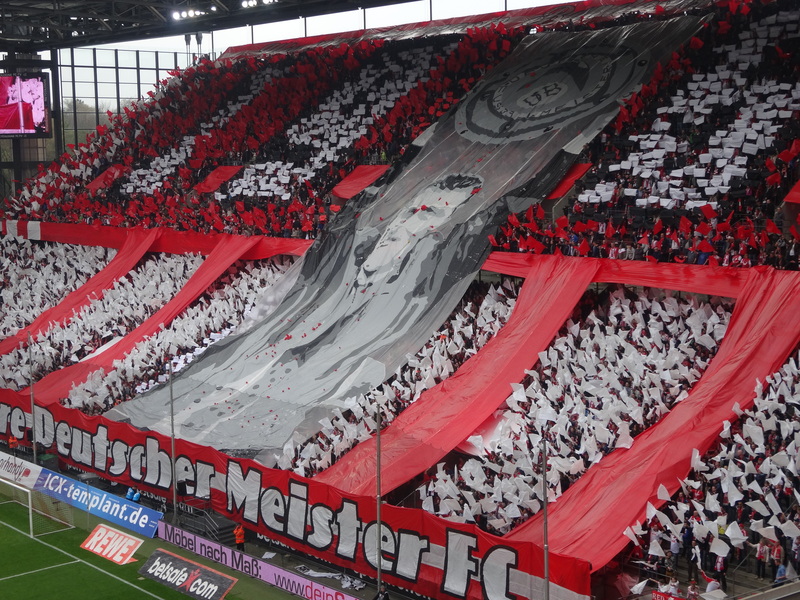 Further, I know that Kaiserslautern dropped points at home to Bochum today, just making things all the sweeter. Nine points above third and twelve above fourth is a nice view with just five matches left. By my calculations, that gives us a magic number (combination of points dropped by St. Pauli and points won by the Effzeh) of four, for a top-three finish. Seven is the magic number for a direct promotion finish. Neither goal is achieved, but it’s very close. Cannot wait to celebrate it. For now, I’m going to enjoy a very low-intensity viewing of Saturday’s match. Hope you all were able to dig it as much as I think I am. Those who actually attended, I am sure will have enjoyed it much more. Sweet choreo. Thanks to Martijn Reusken for the photo! Looks like the crowd at Müngersdorf is really excited for the match, as usual. 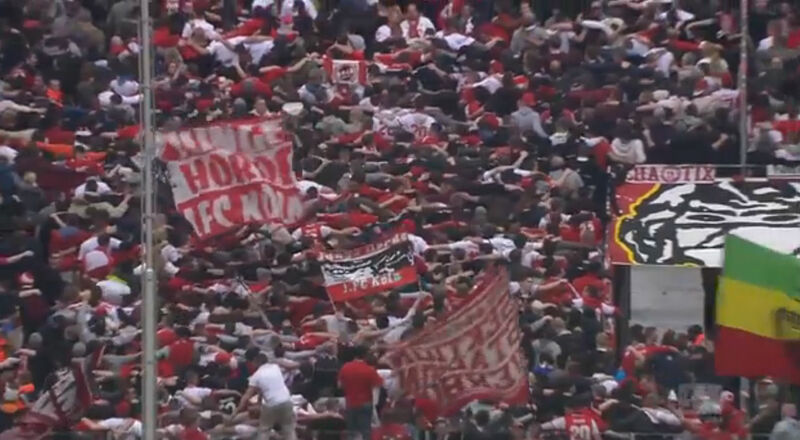 Choreo celebrating the first Bundesliga championship? “Queer gewinnint. . . ” is the banner held on the pitch for a moment, as part of a pro-tolerance campaign. Something about there being no such thing as “gay passes.” Not 100% on the messaging and what to what it might be responding in particular. The goal of everyone being welcome is enough for me, honestly, but I’m pretty far away from all of it, so . . . who know? 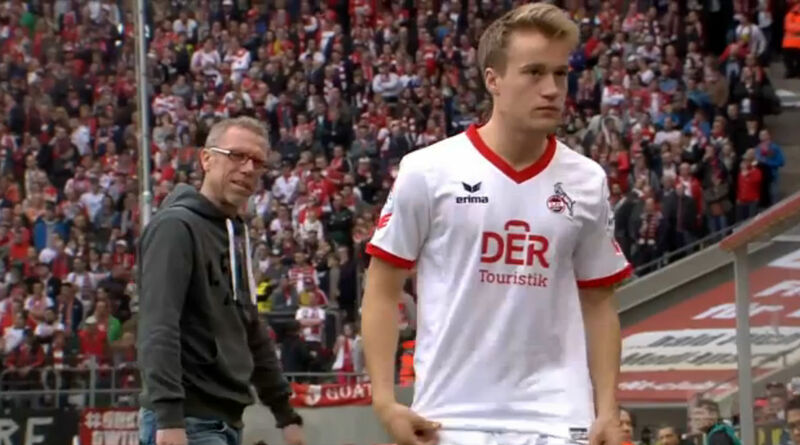 I had actually thought the mention of a new jersey sponsor was part of an April Fool’s gag and dismissed it entirely, but the familiar “REWE” is not on the shirts of the players today, rather “Der Touristik.” Now I will have to go back and read stuff I’d ignored. That is a huge problem with that day: I’m so skeptical of anything said on April 1 that I’m clearly missing actual news! So it IS Kevin Mc Kenna in central defense from the start in place of Kevin Wimmer. Hellooooo Canada! Marcel Risse at right back for Miso Brecko. I think both moves were fairly expected. Matzelinho wears the armband in place of the suspended captain. Good for him. He’s had one hell of a season. Does Miso Brecko have a brother twice his side? Dude’s an ox! He can’t play?! Didn’t know we’d see Pritsche starting for Bielefeld, though. Seemed he’d been more a sub for Arminia since arriving there, but I don’t know that for sure. I could look it up. I’m not going to. Not now, at least. 3: I like seeing Peszko running freely in Bielefeld’s half. I like that he knew he had Jonas Hector with him on the left as he approached the Bielefeld back line. I did NOT like the pass he made. Positioning-wise, there’s no reason that attack should have ended there with a Bielefeld clearance. Was close, but Hector deserved more of a chance to get to the ball than what Peszko gave him. 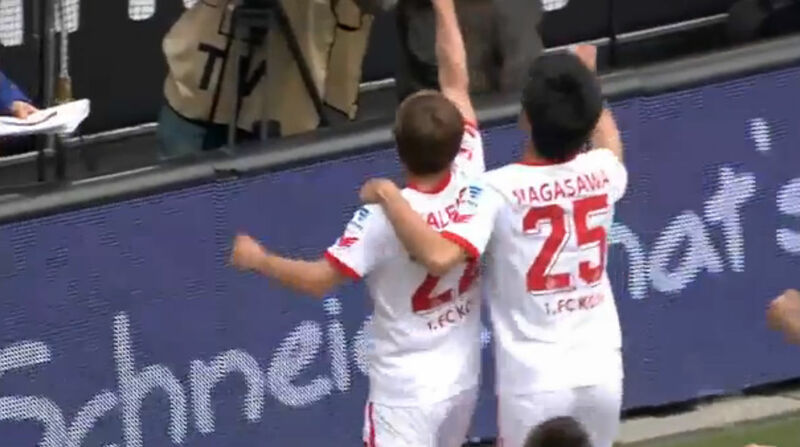 4: Kazuki Nagasawa makes an early appearance with very optimistic attempt from too far away that is far too wide of goal. If you’re going to shoot from there, you have to make it interesting, kid. Yeah, it wasn’t great, mate. 10: First big chance for Bielefeld comes from Przybylko, who is in the right spot to head a cross goal-ward, though far too high. Marcel Appiah, though, had way too much free space from which to launch that cross. When’s the last time we were able to celebrate a lead this early? Nagasawa gives ball up to his left just as he is challenged at edge of penalty area. Nagasaway puts a little too much Senf on this pass. Ball is too wide and deep for a direct continuation of threat from there. Peszko tracks the ball down, with no Bielefelders in pursuit, near the corner flag. He then turns around and crosses into the area. Peszko beats everyone to the ball by enough so he has time to really set himself up to launch the cross. The ball deflects off Felix Burmeister directly to Daniel Halfar’s chest a few steps inside the area. Halfar chests the ball down and steps into it with his left foot, easily beating Stefan Ortega for what we now know to be the game-winning goal. Let’s hear it for the boys in the band. 14: After a Lehmann pass deflects off the referee, Bielefeld has a chance. Patrick Schönfeld, though, stumbles away from the ball trying to position himself for a shot, making an easy take-away situation for Dominic Maroh. That was some ugly lack-of-technical-ability there. 16: Christian Müller gets the first yellow card of the match for essentially smacking Halfar in the face. He didn’t seem to really be doing much more than trying to ward Halfar off the ball, with enough frustration in his heart to let it extend into more contact than what was needed. 18: Some dodgy moments in defensive end with McKenna after Maroh made a nice play to stop the Bielefeld attack. The rust nearly cost possession in the defensive end, but, well, I suppose maybe there just is a gap in class here because a series of passes send action the other way without any true danger. In other observations . 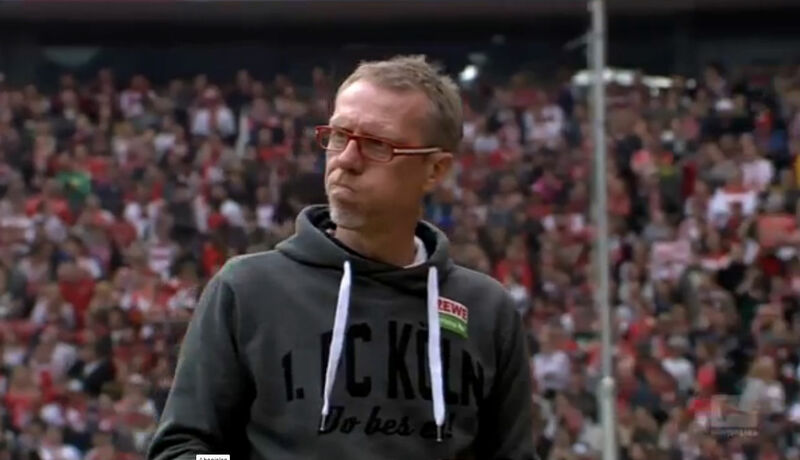 . . is Peter Stöger growing a goatee? Dig the new facial hair, coach. Plus, cool hoodie. 21: Bielefeld, despite trailing, is not interested in pressing with the Effzeh defense in possession. I don’t suppose I can blame them, but wouldn’t that be a good place to take chances? I mean, you need points . . . McKenna has already shown some signs of rust . . . what you waiting for?! 25: Pesko with a little space tries to pound a ball through several defenders, rather than pass along edge of box where Halfar would have had more room to work. Wasteful. 26: More action in Bielefelds end. Nagasawa calmly possesses ball from an Adam Mattushyk pass, sets himself up near the penalty spot, turns, and fires, but Ortega is there. Halfar gets the deflected ball for a chance which is blocked back to him, whereupon he takes a chance with a header. Shot sails wide of the post. The football here was thrilling, but I got a kick out of watching Nagasawa watch the aftermath of his shot and Ortega stop. Nagasawa stays on the ground to watch Halfar try to score off the deflection. 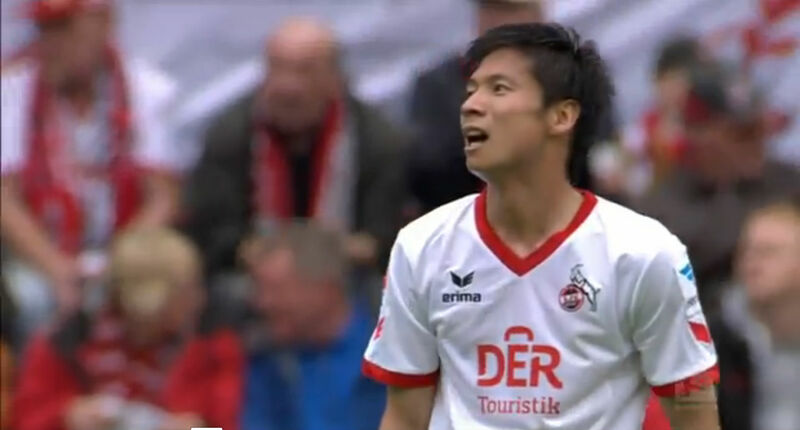 Nagasawa cannot bring himself to get up, lest he miss all the excitement of Halfar’s near score on the header. Then it’s all “AW MAN! YOU’RE KIDDING!” but in Japanese, I’m sure. 27: Hector gets on end of a long ball forward with Ortega to beat. Ortega gets a foot on the ball, deflecting it high. The Bielefeld keeper then is able to just tap it with his hand, barely above the head of Hector, toward his own goal, where a teammate is there to clear. 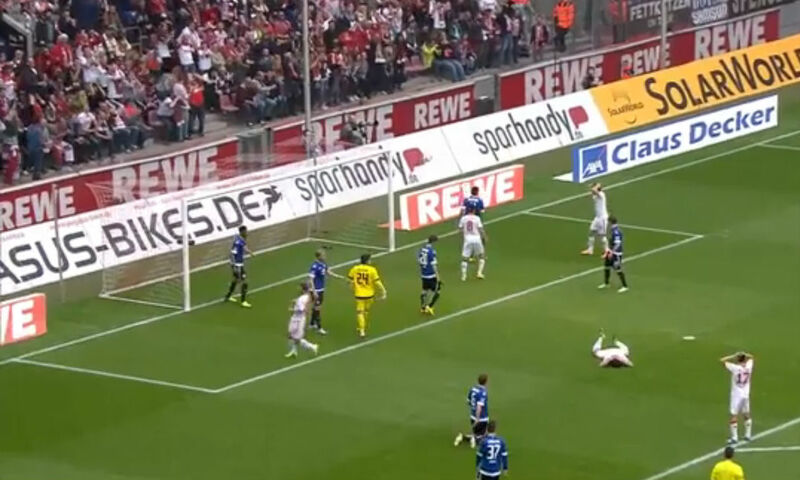 31: Bielefeld is unreasonably willing to watch as the Effzeh passes the ball around in their end. Eventually, Hector makes a great early cross into the box, just out of the reach of Helmes. Chances piling up just because Bielefeld isn’t really doing much to challenge or attack. 34: Great defending of a long ball by McKenna as he tumbles onto his backside afterwards. 37: Risse tries from distance. It’s funny that Bielefeld’s passivity isn’t really forcing Risse to play further back where he’s meant to be a right back. He is largely seen where you’d expect him to be as a midfielder. This is not an exciting match. It’s great that it’s one-sided, of course, but Bielefeld is lame. 40: McKenna misplays a long throw-in, heading the ball away from the post toward the top of the penalty area. Arne Feick gets a free shot at goal, but misfires. A bit lucky. 43: An incredibly weak Bielefeld free kick chance ends a series of long throw-ins and free kicks with no actual work for Timo Horn. Easily the longest stretch of possession for the visitors, but they do very little with it. Halftime: What is there to say. The right side is leading. Everything is well under control. 53: My goodness is NOTHING happening. Matuschyk half-heartedly shoots from distance, with the ball sailing far too high to be of interest. but I’m ready to go clean the kitchen this is so dull. Both Hennes and I WANT to stop watching, but we can’t! Can you imagine a Bielefeld v Aalen match? I wonder if I’d be quite as bored with it were the outcome a mystery. 55: Well, there’s some action. 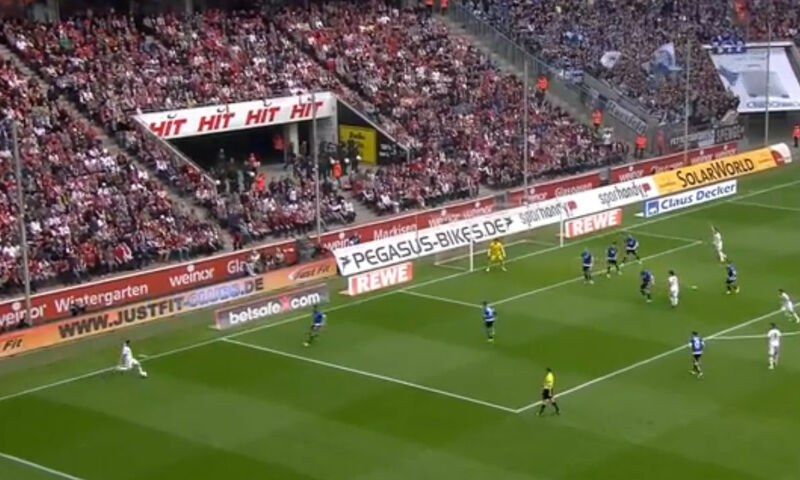 Bielefeld has a HUGE chance go by the post when the well-marked Przybylko does not impede a cross into the area, and the ball travels to the unmarked Müller, who flicks it wide. Horn was there, but it could have been trouble with a more on-target shot. I suppose that’s why you play the way Bielefeld has played. 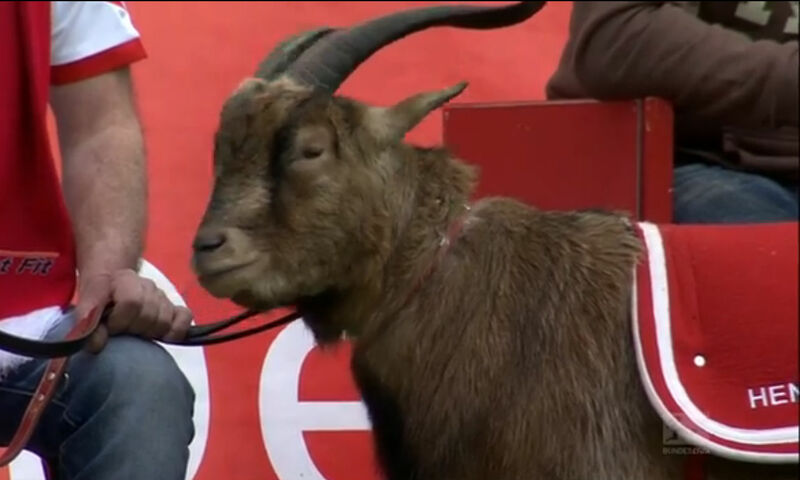 They are down one, yes, but just the one despite getting manhandled by the Effzeh. A little luck there and they’ve completely unearned being level. Flip side, a little luck the other way and it’s a three- or four-goal deficit. 56: What the hell is going on here?! An Appiah cross nearly finds our big loaned-out youngster at the post. Can’t tell if he actually gets a boot on it, but Horn actually has to deflect the ball out for a corner. 57: Foul on Nagasawa. I don’t even remember him getting a yellow, but he has one, according to the commentator. Needs to be more careful or maybe substituted, just to be safe. And, just like that. . .
Well, I don’t know who Finne will replace, but he’s coming. I really want to know what Stöger is thinking that made his face look like that. 58: It’s Helmes off for Finne. Somehow Helmes does not have a yellow despite multiple fouls. Helmes played aggressively in the offensive end, but was pretty much a non-factor today. Bit disappointing, really. 60: Horn grabs a cross out of the air after some nice play by Bielefeld near the corner flag to get free to launch the cross. Probably the most Horn has had to do all day. 62: Wouldn’t it be something to score off a corner? 63: Fabian Klos on for Jan Fießer, which makes me wonder why Klos wasn’t playing. I think of him as Bielefeld’s top offensive player. Weird. 66: Another bit of chaos in the defense that ends with nothing of note. Bielefeld definitely has a chance there, but the Schönfeld shot sails high after both McKenna and Maroh fail in their attempts to clear the ball from the area. Again glad I know we get all three points today, or I’d be a bit alarmed at how the second half is running. 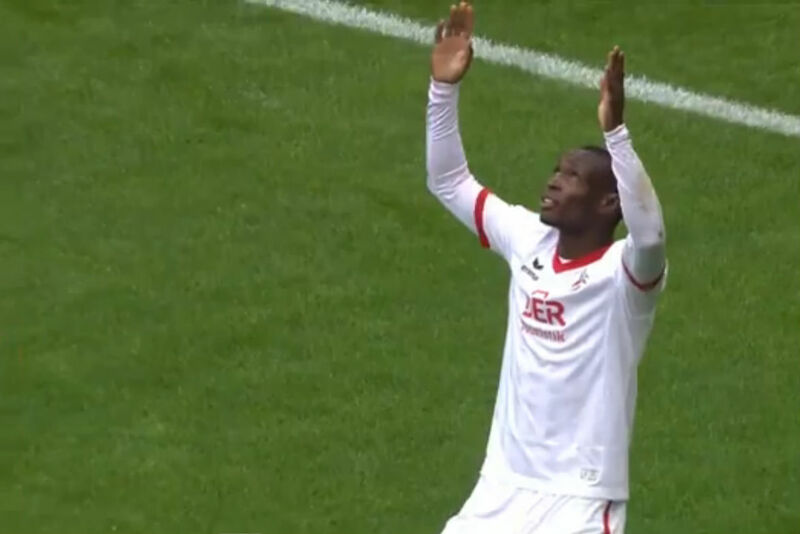 67: After a near chance for Finne and Halfar to connect rolls harmlessly across the goal mouth, it’ll be Ujah on for Nagasawa. 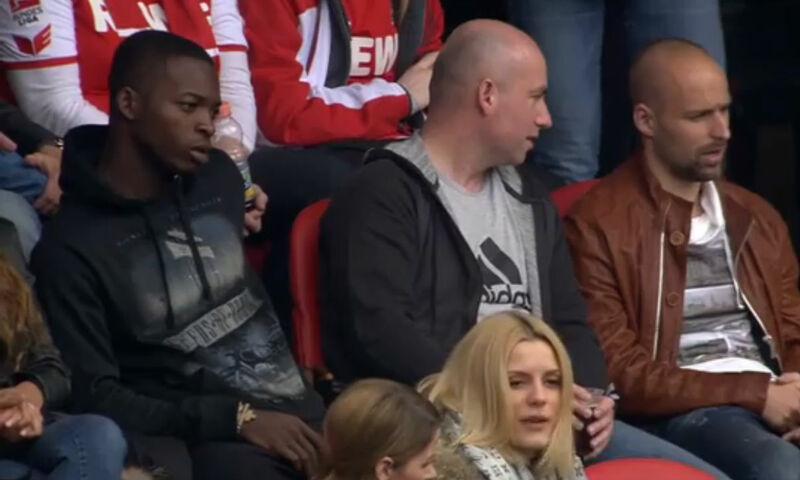 Probably for the best for Nagasawa to go off, but HELLO UJAH! 72: Peszko makes a long run from about midfield all the way to the goal line. Could have passed to Finne, but didn’t trigger by the time he saw the youngster had drifted offside. Peszko ultimately tries to stick the ball through Ortega. The keeper deflects the ball high and toward his own goal where it’s headed into safety by Feick, otherwise Ujah would have been able to pounce easily on it. 73: Ben Sahar on for Pritsche. 75: Great pass for Finne from Halfar puts Finne alone with ball running toward goal. Shot is saved by Ortega’s right foot. I know the 2:0 is coming, but MAN! The relief of ending the long drought. Ujah & Finne in double-attacker set-up Friday? Finne again got loose with the ball. A challenge sent him toward the flag with the ball where two defenders try to pen him in, but Finne escapes with the ball and launches a cross for Anthony Ujah to get his first goal in a LOOOONG time. He’s visibly relieved. Second goal means it’s time to do the Poznan? 79: Hector coming off for Yannick Gerhardt. 81: Okay, I love McKenna, but maybe he’s the one who should have gone off. Bielefeld really should have scored off his horrible backpass, which was essentially a great lead pass for Schönfeld. Horn is forced out to challenge. Schönfeld dribbles around Horn, but Horn sticks with him to prevent him getting a shot or driving to goal. Schönfeld finds Sahar joining the play. Sahar’s shot is on target, but Maroh is there to save the chance and clear it away. Maroh then goes over to McKenna and rubs his head a bit, as some sign of encouragement. Certainly nobody need tell McKenna how huge an error he made. 86: Peszko gets clear for a chance from outside the area. Not too hard for Ortega to collect it, though. 88: Great idea and execution by Halfar to arc a pass over the defense for Matuschyk. Matu gets a foot on the ball in air, but it goes straight into Ortega’s stomach. 90: Appiah running free on far side and strikes a low cross, but McKenna clears beyond the goal line. Peszko pass into middle of area is just lying there for Lehmann to run onto and drill a killer shot onto goal, but Ortega is there and drags his left foot while a bit off-balance to deflect it away. It was a hard-struck shot, but you wouldn’t call it precise or we’d be calling it a 3:0. And that’s it. Another dominant performance by Effzeh prevented from being a rout by the efforts of the keeper Ortega. Otherwise, Bielefeld had no business being on the pitch. I suppose it’s fortunate for them Dynamo isn’t bothering to take too many points, because they are still in the mix for the playoff spot for now. A fine match day for all of us. Not time yet to truly discuss fortifications for the coming Bundesliga season, but we can certainly start wondering about players and strategy, I would say. How do we lock Stöger into staying for ever and ever? Do we even bother to hope Ingolstadt can take points at home from Fürth Monday night? Keep taking care of business and the help is irrelevant. Even so, the more the better. I’m ready to party. Friday in Berlin for Union. . .they’re falling apart over there. May as well keep the momentum going boys! But first, I need to get this finished, do my Sunday work around the house, and get ready for Game of Thrones. Big weekend here in Seattle. Be the first to comment on "Effzeh auf English: Re-Live Blog of 1. FC Köln vs Arminia Bielefeld"